The Aquos K series comes with the form-factor-standard display size of 3.4 inches and resolution of 540 x 960 px (QHD). Sharp are yet to implement their IGZO displays in the flip-type keitai – this one is still equipped with their standard series TFT displays. The reason is probably the significant manufacture costs of IGZOs. Although not expressly specified in the features list, the Aquos K SHF34 most likely employs the S-PureLED backlight that ensures great brightness and accurate colour reproduction – simply because the SHF33 has it. On the outside there is the familiar black-and-white organic electroluminescent display(EL) display for current notifications. The Aquos K SHF34 is powered by Snapdragon 210 processor that has four cores clocked at 1.1 GHz. There has been a downgrade in comparison with the summer 2016 SHF33, which comes with a Snapdragon 400 (MSM8926) at 1.2 GHz. The phone has 1 GB of operating memory and 8 GB of built-in storage capacity that can be expanded to up to 32 GB using SDHC cards (same as on the SHF33). Supported connectivity methods include 4G LTE (800 MHz + 2.0 GHz) and VoLTE, 3G and GSM frequencies for overseas use, single-channel (2.4 GHz) Wi-Fi b/g/n, tethering of up to 10 devices supported, One-Seg (watching only), Bluetooth 4.1, and Infrared. The Bluetooth version on the SHF33 is 4.0, so this is the only difference between the two. The new feature here is support for Miracast, which allows duplicating the phone's screen on a compatible TV set. Also added is support for NFC, whereas the SHF33 only supported the Japanese Felica Osaifu-Keitai functionality. There is no mention of Emopa support, which was featured (v. 4.0) on the SHF33, which was the first traditional keitai to have it, hopefully not the last. Let's look at the camera. A downgrade again: now 8 MP (in contrast with the 13.1 MP on the SHF33). The camera on the Aquos K SHF34 doesn't even have a flash. At least the autofocus is still present, as well as the vibration reduction and camera shake reduction functions (for photos only). A further downgrade is in the ability to shoot macro (close-up) photos – whereas the SHF33 hs native support for this, the SHF34 can only take macro shots via software processed zoom-in. Wonder why Sharp added the Miracast feature that they advertise for its ability to show photos taken with the phone on a TV screen when they will certainly fail to impress. Like all earlier "new" generation flip-keitais, the SHF34 uses a non-touch screen, instead relying on the Touch Cruiser EX where the entire keypad and cruiser area can detect and handle touch commands to navigate the menus, apps and websites. It is unclear what version of Android the OS is based on – we can only guess it's higher than the heavily customised 6.0 found on the SHF33. A notable upgrade is found in the waterproof feature – now IPX5/IPX8 (up to IPX7 on the SHF33). Dustproof is the same IPX5. Luckily, the shock-proof feature has been preserved: this Aquos K is impact resistant in accordance with the Japanese Ministry of Defence MIL-STD-810G Method 516.7:Shock-ProcedureIV - supposed to ensure your phone won't break to pieces if you drop it from a height of 1.22 metres. There is no mention of the Dynamic Receiver feature found on the SHF33 (where the sound is transmitted in the form of vibrations along the entire body of the phone instead of from the speaker). The Aquos K SHF34 has a larger-capacity battery: 1,800 mAh. The SHF33 has a 1,410 mAH battery. The dimensions remain exactly the same: 113 × 51 × 16.9 mm. The weight is now 132 grams, which is 2 grams more than the SHF33. 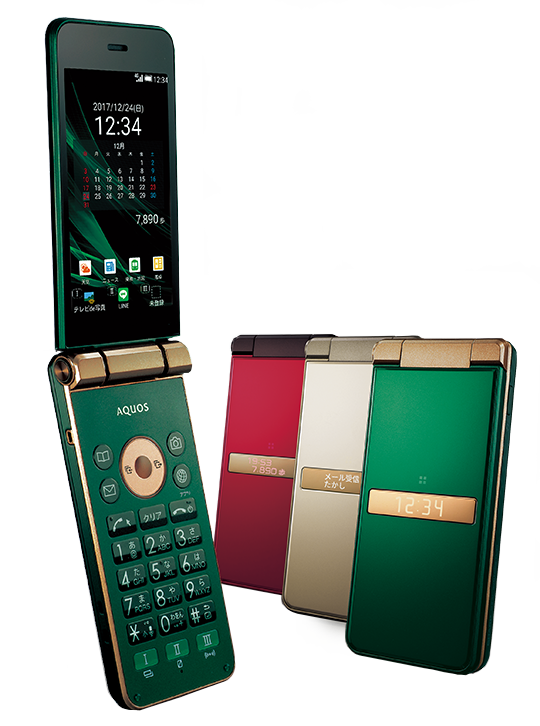 The Aquos K SHF34 is offered in royal green, rouge red, and Champagne gold.